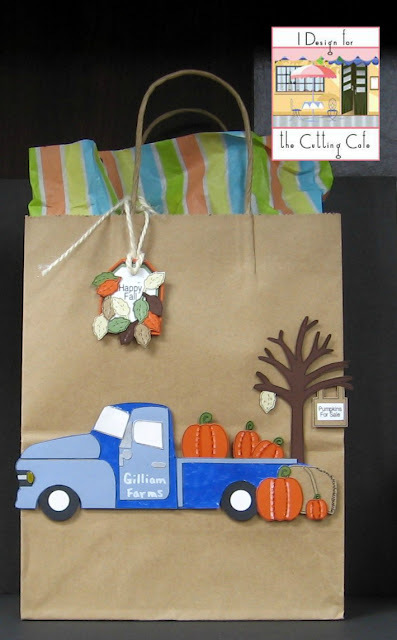 Today, I'm sharing a cute gift bag made with one of the fun files at The Cutting Cafe. I'm using the 'Happy Fall Scene Card Template'. Once again, I have used the PDF version. All pieces were cut out by hand. No cutting machine? No worries! Just grab your scissors, print your pieces and have fun cutting! I do have a Silhouette machine, but for some reason, it's not cutting, so until I get some answers, I'll be using my little scissors! I decided to make a front for this gift bag, rather than a greeting card with my truck template. This is FABULOUS! LOVING that truck and the pumpkins!!!!!!!!!! Love the pick up truck - they are so popular this year. This will make an awesome gift bag for a male. Lots of fussy cutting. What wonderful cut elements you used for your awesome gift bag. Your design is so lovely. Fantastic gift bag Patti. Love the great die-cuts... perfect fall scene! What a great bag - perfect for either gender! Oh my, this is the nicest bag I've seen yet. I love how you decorated it and I'll bet it was a hit of the party. You are so creative lady! So darn cute!! Love the truck and see it is personalized...fabulous! !